Sitemate used Appcues to increase customer engagement, save engineering time, gather feedback, and expand globally. A clear focus on developing exemplary experiences and leading with the product allowed the software startup to actualize their growth potential. Within the first 6 months of using Appcues, Sitemate doubled their engagement rate, expanded from 1 country to 100, and saved engineering resources worth thousands of dollars. They also doubled the rate of feedback they received every week. Sitemate's flexible software platform Dashpivot enables companies in heavy industries (construction, infrastructure, power, mining, oil and gas, etc.) to digitize and streamline how they capture, organize, and track their work—making them smarter and more productive in the office and on site. Built for heavy industries and designed to work for and across all business functions, Sitemate’s product Dashpivot is used by thousands of engineers, foremen, project managers and their companies. As the leaders of a fast-growing startup, Sam McDonnell and Lance Hodgson strongly believe in making their in-app experience the biggest lever of their growth strategy. They understand the importance of having a robust onboarding process and delivering personalized messages to help users navigate their initial experiences within their product. This is why they leave no stone unturned in their efforts to understand their customers’ behavior and iterate the product accordingly. 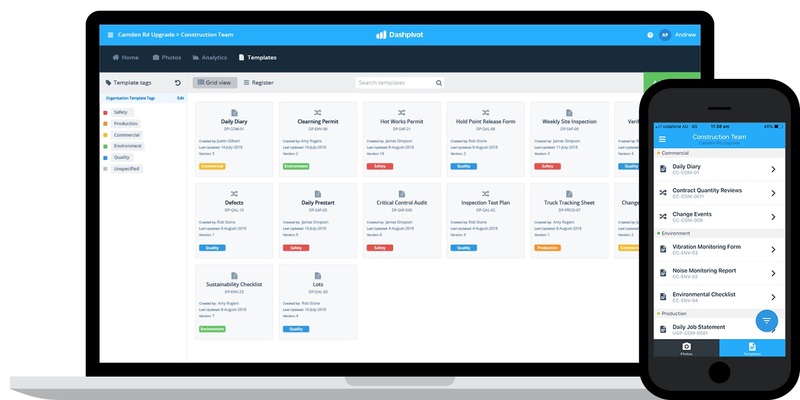 As a product-led company on a mission to make it easier for heavy industry businesses to manage their information, Sitemate decided to introduce a free trial model to attract good fit customers. This meant that they had to automate the delivery of personalized experiences to the right type of users. They tried to engage users with emails with limited success. They realized that in order to ensure product adoption, they needed to provide contextual information while users were actually using the product. So they started searching for a solution that would empower them to tailor experiences based on the in-product behavior of different user segments. Appcues easily integrated with their tech stack, so they decided to give us a try. The team at Sitemate wanted their users to learn how to use the product, drive them to value, and retain them. The biggest challenge they faced was the fact that end users were accustomed to using the conventional approach of paper-based record keeping that they had relied on for decades. In order to create new habits and abolish old ones, they had to provide an experience that would drive their users to value faster than the status quo. On top of that, they wanted to eliminate the guesswork for their users by creating an experience that simplified decision-making and reduced friction. In order to achieve that, Sam used Appcues to create a welcome modal which he personalized for each new user. As soon as the user clicked on the next button, they were taken to another modal that asked them to watch a product explainer video. 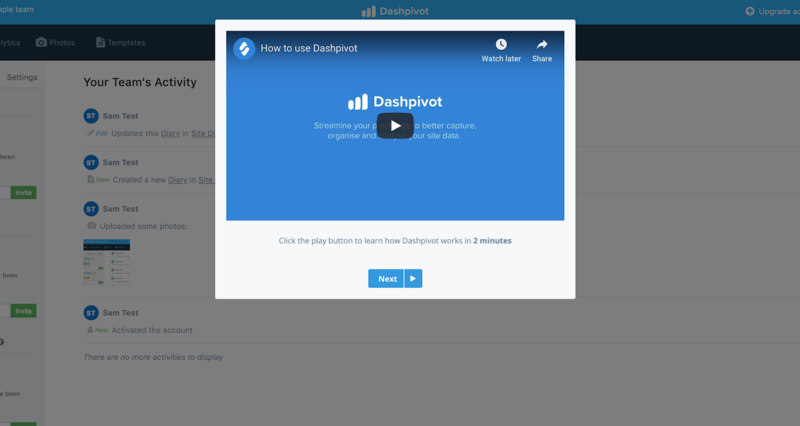 These modals helped Dashpivot users understand how the product works and why they should continue exploring it—all within the first 3 minutes of their in-product experience. The team recognized that users would still need further guidance for the first few steps. So they created tooltips and slideouts with Appcues that provided contextual guidance at each step of the users' journey. Dashpivot’s north star metric for engagement is the frequency of pictures and forms uploaded by customers. 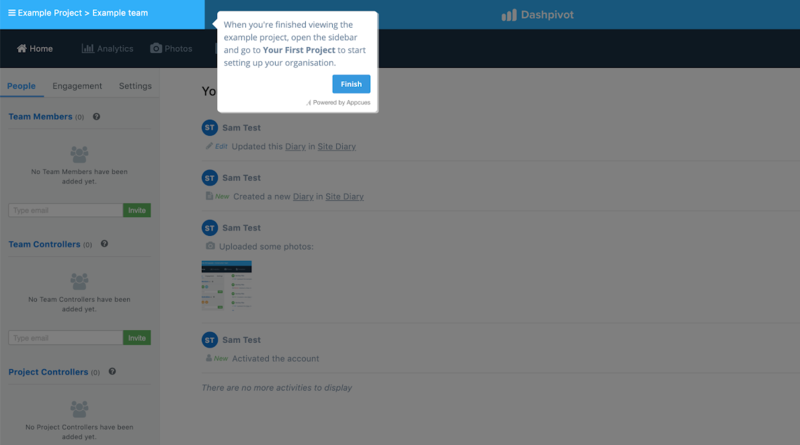 If the users don’t upload pictures and forms frequently, it is a clear indication that they are not properly adopting Dashpivot as their information management system. Prior to using Appcues, the engagement rate for Dashpivot averaged 30%. Within the first 6 months of using Appcues, the engagement rate increased to 60%. As a business serving B2B enterprise customers, the Sitemate’s target users expected personalized onboarding sessions. Training users who were not as technical was a challenge that could only be addressed through in-person meetings and frequent phone calls. This meant that Sam and Lance had to schedule on-site sessions or phone calls to ensure that the key stakeholders were adopting their product. Seeing early success with the automated experiences created with Appcues, the company started extending their free trial to heavy industry businesses across the globe. With Appcues, the startup went from being a local business in Australia to reaching customers in over 100 countries within just 6 months. The growing team wanted their engineering resources to focus on the product roadmap, rather than building in-product experiences. "As Head of Customer Success at a startup, I'd been looking for something to do what Appcues does so that our engineering team didn't have to spend time building, implementing, maintaining, and tweaking [experiences]." Using Appcues, Sam and Lance could create these user experiences on their own without involving any dev resources. This helped them save an estimated $20,000 on the initial cost of building their own experience, and around $12,000 in expected maintenance costs. Prior to using Appcues, Sam and Lance would gather feedback by calling customers or scheduling in-person meetings. As a fast-growing company, they needed to find a way to gather qualitative and quantitative feedback at scale, without spending hours on the phone. So they started using Appcues’ NPS surveys within their product—and quickly doubled the amount of feedback they received every week. 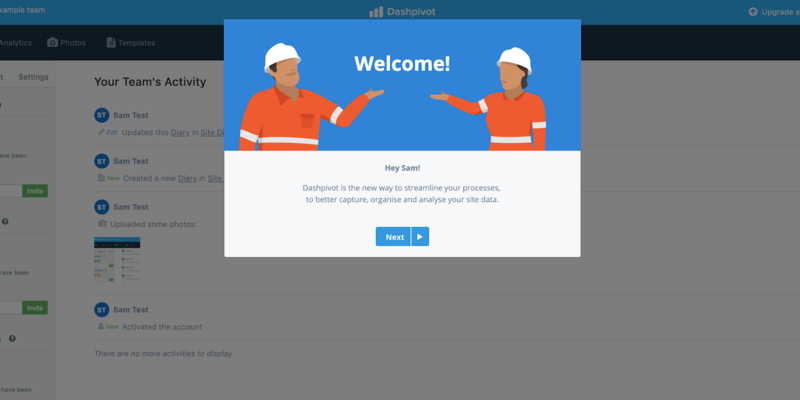 Dashpivot is revolutionizing the way heavy industries collect, organize, and track critical information by creating touchpoints at each step of the users’ journey and making refinements to their product based on a growing repository of user feedback. They are reaping the benefits of being product-led and making their product experiences the core of their growth strategy. Appcues helps Toast's marketing team ship personalized in-product messages in hours, not weeks. It doesn’t get any bread-er than that!